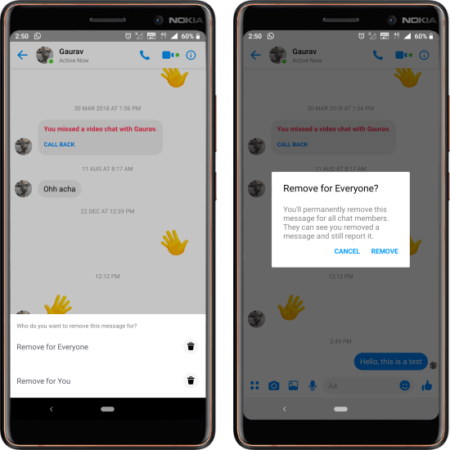 How To Delete Sent Messages on Facebook Messenger? Growing with the chat, IM, email, social media services, at some point in life, we all have wished a sent message to disappear that we sent either accidentally or intentionally. I remember, back in my college days, I send a message to a friend in an angry mood and then my mind changed and I didn’t want that friend to read that message; but there was no option to unsent the message. These days, several services added the functionality to delete a sent message. WhatsApp introduced a feature to delete a sent message from both, your and recipient, ends. Facebook, the parent company of WhatsApp, brings a similar feature to Facebook Messenger. This new feature lets you delete a sent message from the conversation on Facebook Messenger. It is available for both, private chat and group chat, on all the platforms. Unlike WhatsApp, you are only able to delete a sent message within 10 minutes after sending. The delete option won’t be available after that time interval. Deleting a sent message in Facebook Messenger is very easy and straightforward. If you are using Messenger app (Android or iOS), simply tap and hold the message that you want to delete. This opens an option-panel at the bottom of the screen. This panel contains an option to remove the message along with options to copy and forward the message. 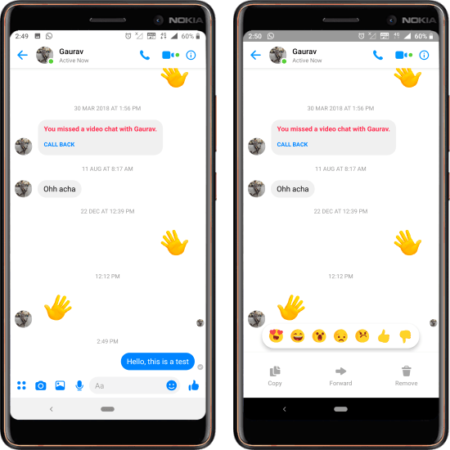 And, if you are using the Messenger on the web (www.messenger.com); hover your mouse cursor on the message and a 3-dot menu appears next to the message. This menu gives you an option to remove the message. When you tap the remove option, it asks you whether you want to remove the message for everyone or for yourself only. Choose the “Remove for Everyone” option to delete the message from the recipient(s) conversation. This step is same for both, Messenger App and Messenger Web versions. Do note that, if you want to delete a message, you have to delete it within the 10 minutes after sending. You won’t be able to delete it message after 10 minutes. Once you deleted the message, in the conversion, the message is replaced by a text notifying that this message is deleted although no one will be able to know what the message was; unless they read it prior to the delete. Check out this feature on Facebook Messager. The option to delete a message upon sending can be very useful in many situations. It gives the users control over their interactions. It can save you from the argument, embarrassment, or other outcomes that your message might have brought. Plus, it can also be used for privacy purposes.